I’ve no doubt everyone pays regular visits to Walter‘s most excellent site A Few Good Times In My Life. If you don’t, GET YOURSELF ROUND THERE NOW! Those of us who do will have been engrossed in his recent recounting of the Maifeld Derby festival in Mannheim. In one instalment, Walter told us of his discovery of the rather wonderful Gemma Ray who he’d never come across before. As a long-time fan, I got to thinking that perhaps I should put together an ICA for the benefit of Walter and anyone else who has not been fortunate enough to encounter one of England’s best kept secrets. So here’s a little collection of some of Gemma’s best moments. I’ve made sure each of her seven albums are represented, but truth be told this could easily have become a double album, and even then some great tunes would have had to be jettisoned. It weighs in at a mere 36 minutes, but I’ve always been a firm believer in quality over quantity and I think I’ve achieved that here in abundance. 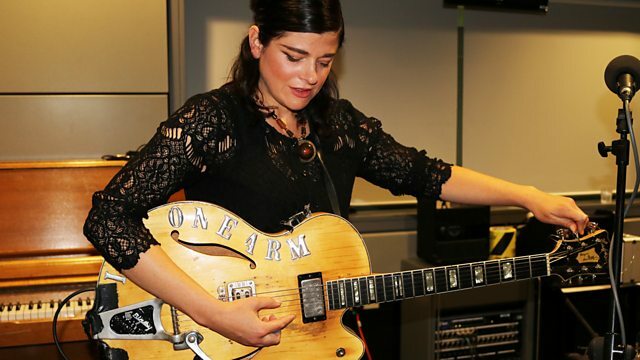 Ladies and gentlemen, introducing the pop-noir of Gemma Ray. By the time ‘Milk For Your Motors’ hit the shelves in 2014, Gemma had already built herself an impressive back catalogue. To date, she’d barely put a foot wrong. This, her sixth album, was her most expansive and featured an array of collaborators. On this track, Giant Sand’s Howe Gelb lends his deep dark voice to the proceedings. Gemma’s debut album, like most of her early work, is dominated by her beloved twangy guitar Li’l One-Arm. Hard Shoulder was her second single and the first track to be heard from ‘The Leader’, setting a bar rather high for such a young artist. ‘Lights Out Zoltar!’ is one of my favourite Gemma Ray albums. It followed hot on the heels of her debut as, due to illness, she wrote it instead of touring. She was clearly on a roll and churned out some of her strongest material. Now this is a treat. In 2012, Gemma teamed up with Russell and Ron Mael. She’d arranged two of their songs, putting her own spin on them. They produced the single and backed her. Yes, it’s Gemma, but I don’t think it matters what you do to a Sparks song, it’s always going to sound like a Sparks song. Nevertheless, a fine job was made of it. One of my favourite tracks. Alight! Alive! opened Gemma’s fourth album ‘Island Fire’, probably her best work. The album was partly written in Australia while unable to fly home due to the eruption of the Icelandic volcano Eyjafjallajökull which caused flights worldwide to be grounded. Another stroke of luck as it turned out. Alight! Alive! has a lovely big bright sound, and any song that uses a Theremin is more than OK by me. Gemma’s third album was a rather daring effort. Sixteen cover versions of one of the widest range of artists you could ask for. Alternative rock (Gallon Drunk, Obits, Sonic Youth) mixed it with jazz and blues (Billie Holiday, Etta James, Memphis Minnie), songs from musicals and all sorts of other delights. I almost included her take on Mudhoney‘s proto-grunge classic Touch Me I’m Sick, but in the end plumped for this gorgeous, glistening rendering of Shirley Bassey‘s timeless classic. Just Gemma and Li’l One-Arm alone. By contrast, here she is in full motorik Krautrock mode. It may not surprise you to learn that Suicide’s Alan Vega is involved here, but it proves Gemma ain’t no one trick pony. Last year’s ‘The Exodus Suite’ brought with it the latest in a string of critical acclaim. Another ambitious record, it saw her stretch herself yet further. The whole thing was recorded live in one week and sees her adding more than a little touch of psychedelia to her sound. I’d love her to expand on this direction on her next record – whenever that will be. Wow, these are really good. I even like the song and LP titles. Nice work, Robster, I am going to get familiar with the rest of the catalog. Great work Robster and thank you for your words. Since I saw her I owned some records by Gemma and I ask myself how I could missed this fantastic music.